Picked up at Laocai Station early in the morning by our bus. Arrive at Sapa round 8:00 AM. After have breakfast. Our tour start at 11:00 AM by jeep to the first village of the black H'mong (Cat Cat village ), walk around visiting people in the village and the hydroelectric power station built by the French in the old days. Take the paths along the valleys between mountains to get to Laochai village. 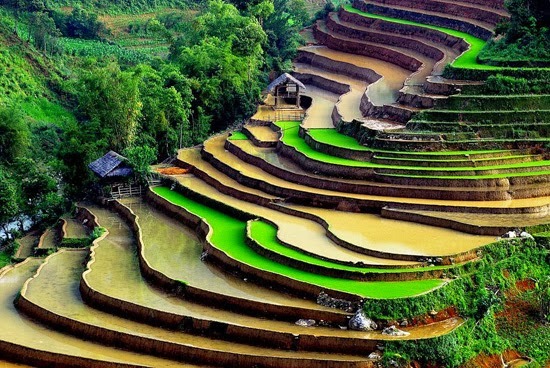 Enjoy the overall pictures of the villages among terraces. Visit the H'mong living in wooden and bamboo houses. Continue going to Tavan village to visit the Dzay minority. Stay the night in Tavan village at a Dzay family. Picnic lunch on the way and dinner at the home-stay. Get up early in the morning to enjoy the daily life of the ethnic minorities in the village. 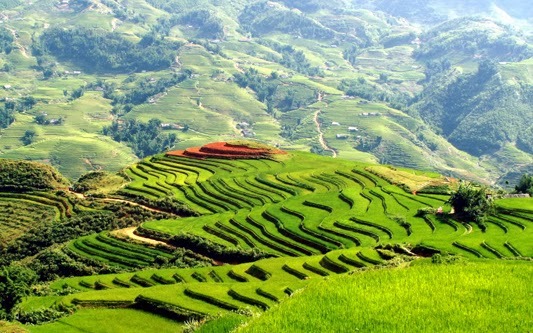 Have breakfast with speciality; and then take the road to GiangTaChai village of the Red Dzao minority via the paths between terraces and through bamboo forests. Visit silver waterfall and suspension Rattan Bridge, visit the people in the village and then cross MuongHoa River up to the mountain to visit the last village of the trek - Supan village of the H'mong. Get back to Sapa by jeep. Free time for shopping in Sapa market .Dinner and stay overnight in Sapa Town. 7h00 transfer to Can Cau market. It takes more than 2 hours to get to Can Cau - a small market situated in a valley surrounded by mountains and only 7 km from China. The market deeply shows the typical cultural features of the minorities in remote mountainous areas in Vietnam. Further more, you can enjoy seeing boys and girls in colourful costumes - different colours of the mountains. They attend the market in the hope of finding "the other halves of their lifves" and this is also the time for them to chat, to exchange everything among different ethnic peoples through cups of wine sold in the market. 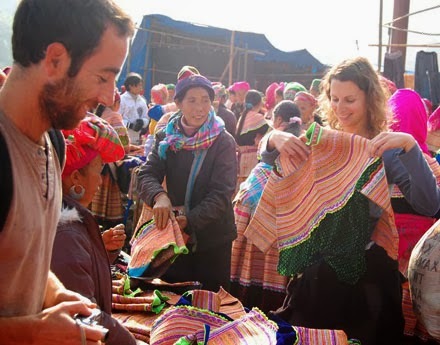 A walk to Bac Ha market. Visit one village and an old building called The H'mong king's house. Have breakfast and the beginning of the day on which you visit a big market filled with many different hill-tribe peoples. This is the most colourful market in North Vietnam. At the market, you have chance to enjoy BacHa people's simple but unique kinds of food with special wines made from rice, cassavas, corn and different sorts of fruits such as plumps, apples, peaches... talking to the minorities through the guide's interpretation. Leave the market for the H'mong King's house (King Hoang A Tuong) built by the French colonists and the Chinese in 1920. Return the town for lunch. In the afternoon, spend time visiting another village (BanPho village) Say good bye to BacHa and get back to Sapa. On the way back, drop in to see the Vietnamese and Chinese Harbor Mouth in LaoCai . Overnight Train back HaNoi . Arrive Ha Noi at 5 h00 . End of great trip. - Jeep go and back as timetable.